It’s another well earned Friday, the gateway to the weekend! I think this Friday Five is pretty awesome! It’s a good time as any to give thanks and appreciate the good things. I know this week tested my patience. Imagine teaching 300+ middle schoolers the week they are getting out for Spring Break!? Hello hormones! Thankfully a break is on the way and it’s much needed for everyone! Yes, yes, yes!! 7 whole days away from school and 4 of those will be spent with my best girl at the beach. Hayden and I are taking a trip! I can’t wait to spend the time with her. We’ve already made some plans of things we want to see and do. I can’t wait. 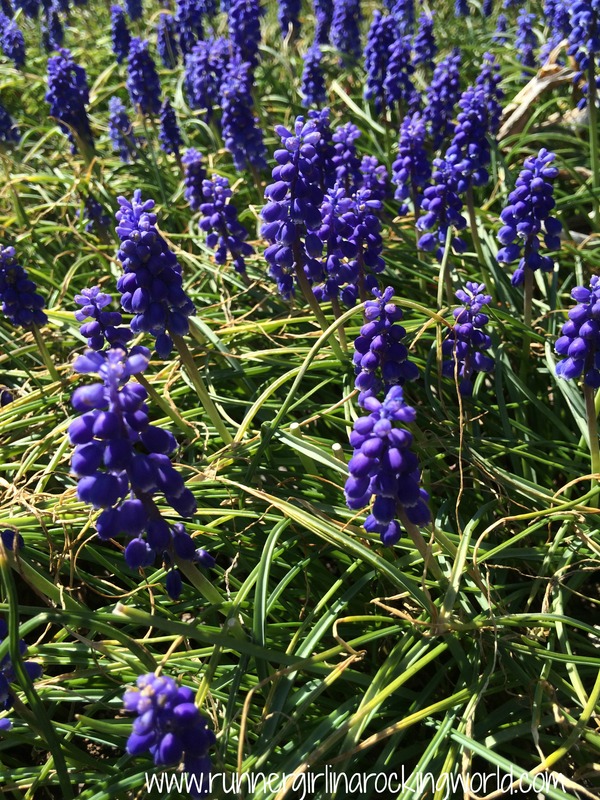 While walking around our school campus, I noticed that the pretty purple flowers that bloom each Spring have sprung! Finally, better weather, sunshine and warmth are on their way. Although Wednesday’s night run was tough until we got warmed up (humidity, boo!! ), I am thankful to not have to bundle up for every run. My favorite time of year for running!! I love nothing more than wearing skirts and tanks. I just snagged more Running Skirts just yesterday. I couldn’t pass up their $50 mystery box of skirts. I’m excited to see what they send me, hopefully there will be something I already don’t own. I’m a bit obsessed. I also just got two new tanks too, one for Flying Pirate! Do you know how hard it is to find a red tank top!? We just started planning some of our summer trips and I’m so excited! We are headed to the beach with family for a week in late June, early July. I’m hoping that I can run the Island Independence 5K again this year! Busch Gardens Williamsburg was running this special deal, a Fun Pass for the summer, for the cost of a one day admission. We grabbed passes, several friends did too! So we have a few trips to plan out so we can all go! It’s only 3 1/2 hours away so it’s a perfect thing to do, even last minute all summer. Our pool also opens in just a few weeks! Looking forward to spending the evenings there until we are out for summer. I am super close to finishing my 2nd consecutive year run streak. It’s still unbelievable to me that I’ve run a year, at least a mile, but to be closing in year 2 is insane. I’m blessed that I’ve been able to do it as long as I have and I’m thankful that I’ve been able to do it too, no injuries! I’m knocking on wood. My friend, Christine, is super close to her year date!! I can’t wait to celebrate it with her and run that 3.65 mile run! 🙂 I guess, we’ll have to do a 7.3 miler for mine!? Too bad it doesn’t fall on a weekend day vs a Thursday. So what’s good with you? What are you looking forward to this Spring or Summer? Any fun trips planned already? Ah it was nice to get out without the running jacket on over here. Its currently grey and miserable today so its nice to make the most of the sunshine and run in tanks and shorts when we can! Isn’t it the best?! I’m so ready for it!! It’s overcast here too but warm. Hoping the sun comes out soon. This is my favorite time for running too! And amen for Spring break! I felt like it would never come. Have a great break! WOW a two year running streak–you are so inspiring! Have a great weekend!! Thank you!! I am still surprised I’m so close to 2 years. WOW that is one crazy long run streak! Great job!! We’ve got a week at the beach coming up Memorial Day weekend that I am soooooooo looking forward to! Oh yes!! I cannot wait to smell that salt air. Yay for beach vacations! Oh man, already?! The humidity is coming soon here. One downside of spring and summer. You will love New York in the summer! Have a super trip! Congratulations on your running streak! I am looking forward to going to Nashville for the Rock N Roll race at the end of the mth and seeing my best friend from college while I’m there. Thank you!! Good luck on your race! How fun! Yay for spring and spring break. Congrats on that streak. Amazing! Yes please to spring break and summer vacation! And congrats on your streak! Wow! Yay for you. Seems like you’ll be having a great time. Congratz on your two year + run streak. Get it! Tanks are great! Not much of a skirt person though. We’re planning our vacations out too and I’m excited for our trips. We’re taking my boys on a trip to Sesame place at some point in the summer, which will be lots of fun. Oh fun!! I’ve heard great things about Sesame Place. You all will have a great time!